ATA Airlines was the low cost airlines of America with its base in Indianapolis, Indiana. It was previously famous by the name American Trans Air. 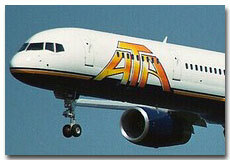 ATA Airlines used to provide scheduled air flight services to several destinations in US mainland and Hawaii. ATA Airlines operated excellent commercial charter flight services in the whole world. Founded in 1973 as American Trans Air (ATA). The airline also operated its air services to support US military in 1991 Gulf War. Chicago Express became the regional associate of ATA in 2000. ATA airline ceased to operate all its flights services on April 3, 2008.